A tetradrachm from Ancient Athens, dated circa 449-413 BC. Contains multiple 'test cuts' which were commonly made by suspicious minds in antiquity to detect forgeries by assessing whether the base metal underneath was the same (silver) or a cheaper metal (e.g. bronze). This coin has silver beneath and is not an ancient forgery. Legitimate coins were minted in casting molds in ancient China but could easily be counterfeited using the same technique from a coin mold of the Warring States period (475-221 BC), in the Qin State. Plated counterfeit coin of the Roman emperor Domitian (81-96 AD). By using a copper core covered in a silver coating, the coin has a much lower intrinsic value, while face value remains the same. Counterfeit money is imitation currency produced without the legal sanction of the state or government usually in a deliberate attempt to imitate that currency and so as to deceive its recipient. Producing or using counterfeit money is a form of fraud or forgery. The business of counterfeiting money is almost as old as money itself: plated copies (known as Fourrées) have been found of Lydian coins which are thought to be among the first Western coins. Before the introduction of paper money, the most prevalent method of counterfeiting involved mixing base metals with pure gold or silver. Another form of counterfeiting is the production of documents by legitimate printers in response to fraudulent instructions. During World War II, the Nazis forged British pounds and American dollars. Today some of the finest counterfeit banknotes are called Superdollars because of their high quality and likeness to the real US dollar. There has been significant counterfeiting of Euro banknotes and coins since the launch of the currency in 2002, but considerably less than for the US dollar. Some of the ill-effects that counterfeit money has on society include a reduction in the value of real money; and increase in prices (inflation) due to more money getting circulated in the economy - an unauthorized artificial increase in the money supply; a decrease in the acceptability of paper money; and losses, when traders are not reimbursed for counterfeit money detected by banks, even if it is confiscated. Traditionally, anti-counterfeiting measures involved including fine detail with raised intaglio printing on bills which allows non-experts to easily spot forgeries. On coins, milled or reeded (marked with parallel grooves) edges are used to show that none of the valuable metal has been scraped off. Counterfeiting is as old as money itself, and is sufficiently prevalent throughout history that it has been called "the world's second oldest profession". Coinage of money began in the Greek city of Lydia around 600 B.C. Before the introduction of paper money, the most prevalent method of counterfeiting involved mixing base metals with pure gold or silver. A common practice was to "shave" the edges of a coin. This is known as "clipping". Precious metals collected in this way could be used to produce counterfeit coinage. A fourrée is an ancient type of counterfeit coin, in which a base metal core has been plated with a precious metal to resemble its solid metal counterpart. When paper money was introduced in China in the 13th century, wood from mulberry trees was used to make the money. To control access to the paper, guards were stationed around mulberry forests, while counterfeiters were punished by death. In the 13th century Mastro Adamo was mentioned by Dante Alighieri as a counterfeiter of the Florentine fiorino, punished with death by hanging. The English couple Thomas and Anne Rogers were convicted on 15 October 1690 for "Clipping 40 pieces of Silver". Thomas Rogers was hanged, drawn and quartered while Anne Rogers was burnt alive. Evidence supplied by an informant led to the arrest of the last of the English Coiners "King" David Hartley, who was executed by hanging in 1770. The extreme forms of punishment were meted out for acts of treason against state or Crown, rather than simple crime. In the late eighteenth and early nineteenth centuries, Irish immigrants to London were particularly associated with the spending (uttering) of counterfeit money, while locals were more likely to participate in the safer and more profitable forms of currency crime, which could take place behind locked doors. These include producing the false money and selling it wholesale. Similarly, in America, Colonial paper currency printed by Benjamin Franklin and others often bore the phrase "to counterfeit is death". The theory behind such harsh punishments was that one who had the skills to counterfeit currency was considered a threat to the safety of the State, and had to be eliminated. Another explanation is the fact that issuing money that people could trust was both an economic imperative, as well as a (where applicable) Royal prerogative; therefore counterfeiting was a crime against the state or ruler itself, rather than against the person who received the fake money. Far more fortunate was an earlier practitioner of the same art, active in the time of the Emperor Justinian. Rather than executing Alexander the Barber, the Emperor chose to employ his talents in the government's own service. Nations have used counterfeiting as a means of warfare. The idea is to overflow the enemy's economy with fake bank notes, so that the real value of the money plummets. Great Britain did this during the American Revolutionary War to reduce the value of the Continental Dollar. The counterfeiters for the British were known as "shovers", presumably for the ability to "shove" the fake currency into circulation. Two of the most well-known shovers for the British during the Revolutionary War were David Farnsworth and John Blair. They were caught with 10,000 dollars in counterfeits when arrested. George Washington took a personal interest in their case and even called for them to be tortured to discover further information. They were eventually hanged for their crimes. During the American Civil War, the Confederate States dollar was heavily counterfeited by private interests on the Union side, often without the sanction of the Union government in Washington. The Confederacy's access to modern printing technology was limited while many Northern-made imitations were printed on high quality banknote paper procured through extralegal means. As a result, counterfeit Southern notes were often equal or even superior in quality compared to genuine Confederate money. In 1834, counterfeit copper coins manufactured in the United States were seized from several ships with American flags in Brazil. The practice seemed to end after that. In 1926 a high-profile counterfeit scandal [hu] came to light in Hungary, when several people were arrested in the Netherlands while attempting to procure 10 million francs' worth of fake French 1000-franc bills which had been produced in Hungary; after 3 years, the state-sponsored industrial scale counterfeit operation had finally collapsed. The League of Nations' investigation found Hungary's motives were to avenge its post-WWI territorial losses (blamed on Georges Clemenceau) and to use profits from the counterfeiting business to boost a militarist, border-revisionist ideology. Germany and Austria had an active role in the conspiracy, which required special machinery. The quality of fake bills was still substandard however, owing to France's use of exotic raw paper material imported from its colonies. During World War II, the Nazis attempted to implement a similar plan (Operation Bernhard) against the Allies. The Nazis took Jewish artists in the Sachsenhausen concentration camp and forced them to forge British pounds and American dollars. The quality of the counterfeiting was very good, and it was almost impossible to distinguish between the real and fake bills. The Nazis were unable to carry out planned aerial drops of the counterfeits over Britain, so most notes were disposed of and not recovered until the 1950s. Today some of the finest counterfeit banknotes are called Superdollars because of their high quality, and likeness to the real US dollar. The sources of such supernotes are disputed, with North Korea being vocally accused by US authorities. The amount of counterfeit United States currency is estimated to be less than $3 per $10,000, with less than $3 per $100,000 being difficult to detect. There has been a rapid growth in the counterfeiting of euro banknotes and coins since the launch of the currency in 2002. In 2003, 551,287 fake euro notes and 26,191 bogus euro coins were removed from EU circulation. In 2004, French police seized fake 10 euro and 20 euro notes worth a total of around €1.8 million from two laboratories and estimated that 145,000 notes had already entered circulation. In the early years of the 21st century, the United States Secret Service has noted a substantial reduction in the quantity of forged U.S. currency, as counterfeiters turn their attention towards the Euro. As a result of their rarity, gold and silver certificates have sometimes been erroneously flagged as counterfeits in the United States, when they have in fact been genuine. Due to the fact that these banknotes carry significant numismatic value, and are sought after by collectors, counterfeit examples have surfaced on eBay via unscrupulous sellers. A batch of counterfeit A$50 and A$100 notes were released into the Australian city of Melbourne in July 2013. As of July 12, 2013, 40 reports had been made between the northern suburbs of Heidelberg and Epping. Police spokespersons explained to the public in media reports that the currency notes were printed on paper (Australia introduced Polymer banknotes in 1988) and could be easily detected by scrunching up the note or tearing it. Additionally, the clear window within the notes was also an easy way to identify fake versions, as the "window appears to have been cut out with two clear plastic pieces stuck together with stars placed in the middle to replicate the Southern Cross". Police also revealed that fake notes had been seized in June 2013 in Melbourne's eastern and western suburbs. According to the Australian RBA figures, during 2014-15, the number of counterfeit $50 currency detected in circulation has more than doubled from the previous year, and more than 33,000 fake notes were removed from circulation. The officials believe this likely a fraction of the amount of fake currencies currently flooding through in Victoria and NSW states. On 31 May 2016, the ACT police have warned people to keep an eye out for fake $50 notes, which is circulating throughout Canberra in recent months. The officers have been called out to more than 35 businesses over the past two months in connection to counterfeit $50 notes.Australian Federal Police have charged two persons alleging to have produced $16,465 notes of counterfeit currency and charged them with various offences under the Crimes (Currency) Act 1981. The police say that Australian notes are hard to counterfeit, with many security features. However, urged people to take a close look each time they spend cash. Anti counterfeit money sign and examples of counterfeit notes received by a noodle shop in Kunming, Yunnan, China. Companies not being reimbursed for counterfeits. This has led to companies losing buying power. As such, there is a reduction in the value of real money. Increase in prices (inflation) due to more money getting circulated in the economy - an unauthorized artificial increase in the money supply. Decrease in the acceptability (satisfactoriness) of money - payees may demand electronic transfers of real money or payment in another currency (or even payment in a precious metal such as gold). At the same time, in countries where paper money is a small fraction of the total money in circulation, the macroeconomic effects of counterfeiting of currency may not be significant. The microeconomic effects, such as confidence in currency, however, may be large. Traditionally, anti-counterfeiting measures involved including fine detail with raised intaglio printing on bills which would allow non-experts to easily spot forgeries. On coins, milled or reeded (marked with parallel grooves) edges are used to show that none of the valuable metal has been scraped off. This detects the shaving or clipping (paring off) of the rim of the coin. However, it does not detect sweating, or shaking coins in a bag and collecting the resulting dust. Since this technique removes a smaller amount, it is primarily used on the most valuable coins, such as gold. 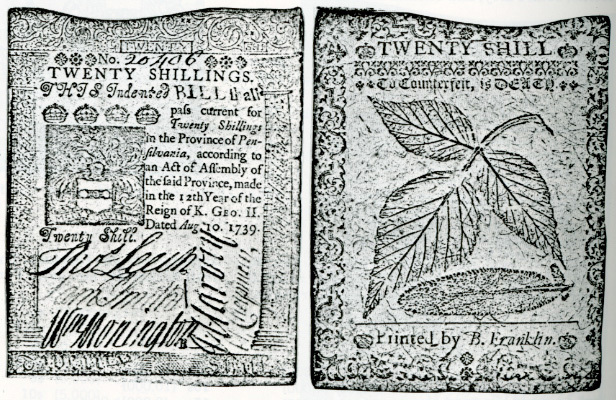 In early paper money in Colonial North America, one creative means of deterring counterfeiters was to print the impression of a leaf in the bill. Since the patterns found in a leaf were unique and complex, they were nearly impossible to reproduce. In the late twentieth century advances in computer and photocopy technology made it possible for people without sophisticated training to copy currency easily. In response, national engraving bureaus began to include new more sophisticated anti-counterfeiting systems such as holograms, multi-colored bills, embedded devices such as strips, raised printing, microprinting, watermarks and color shifting inks whose colors changed depending on the angle of the light, and the use of design features such as the "EURion constellation" which disables modern photocopiers. Software programs such as Adobe Photoshop have been modified by their manufacturers to obstruct manipulation of scanned images of banknotes. There also exist patches to counteract these measures. Recently, there has been a discovery of new tests that could be used on U.S. Federal Reserve Notes to ensure that the bills are authentic. These tests are done using intrinsic fluorescence lifetime. This allows for detection of counterfeit money because of the significance in difference of fluorescence lifetime when compared to authentic money. 2010 $100 bill gets a new design with no oval around Benjamin Franklin's portrait and more colors; along with the inclusion of the new "3D security ribbon"
The redesigned $100 bill was unveiled on April 21, 2010, and the Federal Reserve Board was to begin issuing the new bill on February 10, 2011, but the release was delayed until October 2013. The Treasury had made no plans to redesign the $5 bill using colors, but recently reversed its decision, after learning some counterfeiters were bleaching the ink off the bills and printing them as $100 bills. The new $10 bill (the design of which was revealed in late 2005) entered circulation on March 2, 2006. The $1 bill and $2 bill are seen by most counterfeiters as having too low a value to counterfeit, and so they have not been redesigned as frequently as higher denominations. In the 1980s counterfeiting in the Republic of Ireland twice resulted in sudden changes in official documents: in November 1984 the £1 postage stamp, also used on savings cards for paying television licences and telephone bills, was invalidated and replaced by another design at a few days' notice, because of widespread counterfeiting. Later, the £20 Central Bank of Ireland Series B banknote was rapidly replaced because of what the Finance Minister described as "the involuntary privatisation of banknote printing". In the 1990s, the portrait of Chairman Mao Zedong was placed on the banknotes of the People's Republic of China to combat counterfeiting, as he was recognised better than the generic designs on the renminbi notes. In 1988 the Reserve Bank of Australia released the world's first long lasting and counterfeit-resistant polymer (plastic) banknotes with a special Bicentennial $10 note issue. After problems with this bill were discovered and addressed, in 1992 a problem-free $5 note was issued. In 1996 Australia became the first country to have a full series of circulating polymer banknotes. On 3 May 1999 the Reserve Bank of New Zealand started circulating polymer banknotes printed by Note Printing Australia Limited. The technology developed is now used in 26 countries. Note Printing Australia is currently printing polymer notes for 18 countries. The Swiss National Bank has a reserve series of notes for the Swiss franc, in case widespread counterfeiting were to take place. Philip Alston, was an 18th-century counterfeiter both before and after the American Revolution in Virginia and the Carolinas before the war, and later in Kentucky and Illinois afterwards. Anatasios Arnaouti, a British counterfeiter of more than £2.5 million in fake money, sentenced in 2005. Frank Bourassa, a Canadian counterfeiter, that set up a secret money printing operation capable of printing US$250 million in counterfeit bills. He spent a month and a half in a Canadian jail in 2014, in agreement to not be extradited to the U.S. for prosecution. Edward Bonney, an alleged counterfeiter in northern Indiana, who escaped to Nauvoo, Illinois, was a bounty hunter and amateur detective, posed as a counterfeiter, to apprehend the murderers of Colonel George Davenport and infiltrate the Midwestern Banditti of the Prairie. Abel Buell, American colonialist and republican who went from altering five-pound note engraving plates to publishing the first map of the new United States created by an American. Mary Butterworth, a counterfeiter in colonial America. William Chaloner, a British counterfeiter convicted by Sir Isaac Newton and hanged on 16 March 1699. Alves dos Reis, who by the end of 1925 had managed to introduce escudo banknotes worth £1,007,963 at 1925 exchange rates into the Portuguese economy, which was equivalent to 0.88% of Portugal's nominal GDP at the time. John Duff, was a counterfeiter, hunter, and soldier, who served in George Rogers Clark's campaign, to capture the Illinois country, for the Patriot American side, during the Revolutionary War. Eric "Klipping" V, the king of Denmark (1259–1286). The king's nickname refers to "clipping" of the coin. David Farnsworth, was a British Loyalist American counterfeiter and spy, in the American Revolutionary War. He was hanged for his crimes, after George Washington had taken a personalised interest in his case. Francis Greenway on the first Australian 10 dollar note, perhaps the only convicted forger in the world depicted on a banknote. Francis Greenway was an English-born architect transported to Australia in 1814, as a convict for the crime of forgery, where he rose as a prominent planner of public buildings. He later posthumously became probably the only forger to be depicted on a banknote, the Australian $10. "King" David Hartley, was the leader of the Cragg Vale Coiners of rural 18th century England. Producing fake gold coins, he was eventually captured and hanged at Tyburn near York on April 28, 1770 and buried in the village of Heptonstall, W Yorks. His brother, Isaac, escaped the authorities and lived until 1815. Stephen Jory, Great Britain's most renowned counterfeiter started his career by selling cheap perfume in designer bottles. He later established his own illegal printing operation to produce and distribute at least fifty million pounds in counterfeit currency throughout the United Kingdom. Thomas McAnea, also known as Hologram Tam, a Scottish master counterfeiter regarded as one of the most skillful in Europe with regard to banknote security holograms. Edward Mueller, documented in Mister 880, he was possibly the longest uncaught counterfeiter in history. For ten or more years he eluded government authorities while he printed and spent fake $1 bills in his New York neighborhood. Catherine Murphy, convicted of coining in 1789 and was the last woman to suffer execution by burning in England. John A. Murrell, a near-legendary bandit operating in the United States along the Mississippi River in the mid-nineteenth century. Convicted for his crimes in the Circuit Court of Madison County, Tennessee, Murrell was incarcerated in the Tennessee State Penitentiary, modeled after the Auburn penal system, from 1834 to 1844. King Philip the Fair of France (1268–1314), caused riots and was known as "the counterfeiter king" for emitting coinage that was debased compared to the standards that had been prevalent during the half century previous to his reign. Sturdivant Gang, a multi-generational group of American counterfeiters whose criminal activities took place over a 50-year period from Colonial Connecticut to the Illinois frontier. Albert Talton, was sent to prison for counterfeiting the United States one hundred-dollar bill and the United States twenty-dollar bill. Produced over 7 million dollars in counterfeit US currency using a standard inkjet printer, and was convicted and sent to prison in May 2009. Samuel C. Upham, the first known counterfeiter of Confederate money during the American Civil War. His activities began or became known in early July 1862. Wesley Weber, imprisoned in 2001 for counterfeiting the Canadian hundred-dollar bill. Arthur Williams, imprisoned in 2007 for counterfeiting the United States one hundred-dollar bill. Money art is a subject related to counterfeiting that incorporates currency designs or themes. Some of these works of art are similar enough to actual bills that their legality is in question. While a counterfeit is made with deceptive intent, money art is not; however, the law may or may not differentiate between the two. JSG Boggs was an American artist best known for his hand-drawn, one-sided copies of US banknotes, which he sold for the face value of the note. The street artist Banksy is known for making 10 pound notes that feature Princess Diana's portrait in place of the Queen, while "Bank of England" is replaced by "Banksy of England". The artist's original intent was to throw them off a building, but after some of the notes were dropped at a festival he discovered that they could pass for legal tender and changed his mind. As of 2012, Banksy is still in possession of all one hundred million pounds' worth of the currency. In 2006, American artist Jack Daws hired metalsmiths to make a mold of a 1970 U.S. penny and cast it in 18-karat gold. He then hired another metalsmith to copper-plate it, after which it looked like an ordinary penny. On March 28, 2007, Daws intentionally put the "penny" in circulation at Los Angeles International Airport (LAX). The sculpture was discovered in Brooklyn two-and-a-half years later by Jessica Reed, a graphic designer and coin collector, who noticed it while paying for groceries at a local store. Reed eventually communicated with Daws's Seattle art dealer, the Greg Kucera Gallery, and Daws confirmed that she had discovered the Counterfeit Penny sculpture. In May 2017, Australian currency training notes (used in-house by Chinese banks in the training of bank tellers) were circulated briefly in Darwin, Northern Territory, with seven cases reported by the Northern Territory Police of notes being offered and taken as real money. The $100 (Australian Dollar) notes had Chinese language characters printed on them, but otherwise had the color and feel of real notes, and the Chinese characters can be disguised when the note is folded. They had been sold through eBay, with the disclaimer of not being for circulation. China also has equivalent $50 (U.S. Dollar) "training money", that has previously appeared in the USA. ^ "A Case for the World's Oldest Coin". Retrieved 29 January 2013. ^ "Counterfeiting statistics for several currencies". Itsamoneything.com. Retrieved 2014-09-21. ^ a b "Counterfeiting of American Currency". p. 13. Retrieved 2007-06-12. ^ a b "Counterfeit Money, Who Takes the Hit?". William F Hummel. Retrieved 2007-06-12. ^ Young, Michael. "Learn about the world of counterfeiting from one who lived there." Dallas Morning News, (TX) 15 July 2009: Newspaper Source Plus. Web. 8 Dec. 2012. ^ Van Riper, Frank. "Counterfeiting." Saturday Evening Post 250.7 (1978): 42-44. Academic Search Premier. Web. 8 Dec. 2012. ^ Grant Robertson. "Funny money: How counterfeiting led to a major overhaul of Canada's money". The Globe and Mail. Retrieved 3 December 2011. ^ Crymble, Adam (2017-02-09). "How Criminal were the Irish? Bias in the Detection of London Currency Crime, 1797-1821". The London Journal. 43: 36–52. doi:10.1080/03058034.2016.1270876. ^ a b "Counterfeit notes". Librarycompany.org. Retrieved 2012-10-18. ^ a b Counterfeiting In Colonial America, By Kenneth Scott. p. 258. ^ A Financial History of the United States, By Jerry W. Markham. p. 66. ^ Holton, Chuck (August 29, 2010). "Distributing Counterfeit Currency: An Act of War?". CBN. Retrieved March 25, 2013. ^ Ruth Judson and Richard Porter (1 March 2010). "Estimating the Volume of Counterfeit U.S. Currency in Circulation Worldwide: Data and Extrapolation" (PDF). Chicagofed.org. Retrieved 2012-10-18. ^ "This Is NOT a Counterfeit Bill". finance.yahoo.com. Retrieved 2019-04-11. ^ Cho, Stephanie. "How to Authenticate Older Banknotes". blog.fraudfighter.com. Retrieved 2019-04-11. ^ Thomas O'Byrne (11 July 2013). "Police warn on counterfeit cash". The Age. Retrieved 12 July 2013. ^ The Sydney Morning Herald (28 February 2016). "Australia flooded with fake $50 notes so good they fool banks". smh.com.au. Retrieved 28 February 2016. ^ ABC News (31 May 2016). "Fake $50 notes circulating throughout Canberra, ACT police warn". abc.net.au. Retrieved 31 May 2016. ^ AFP Facebook page (2 September 2016). "Had a close look at your cash lately?". ^ "Money, Fake Money, & Sound Money". ^ "Counterfeit Banknotes" (PDF). Parliamentary office of Science and Tech., UK. Retrieved 2017-06-16. ^ "Photoshop CS5: Photoshop and CDS". Adobe. Retrieved 2012-10-18. ^ Chia, TH and Levene MJ. "Detection of counterfeit U.S. paper money using intrinsic fluorescence lifetime". Opticsinfobase.org. ^ Mark Glassman (8 October 2013). "These New $100 Bills Are Going to Be Huge Overseas". BloombergBusinessweek. Bloomberg L.P. Retrieved 11 November 2013. ^ "Plastic banknotes - Australia Innovates". Powerhouse Museum. 1993-10-28. Retrieved 2012-10-18. ^ "New Zealand's bank notes". Rbnz.govt.nz. 1999-05-03. Retrieved 2012-10-18. ^ S 449 of the Criminal Code, RSC 1985, c C-46, makes counterfeiting money an indictable offence. ^ "Penal Act of Offenses Against National Currency: Article 3". Laws & Regulations Database of The Republic of China. Ministry of Justice (Taiwan). 2011-06-29. Retrieved 2016-09-07. ^ "Forgery and Counterfeiting Act 1981". ^ Fraudulent creation or alteration of United States currency is an offense punishable by 18 U.S.C. § 471. ^ "Master Currency Counterfeiter Prints Millions, Says 'Screw You' to US". ^ Broadbent, James; Hughes, Joy (1997). Francis Greenway Architect. Glebe, N.S.W. : Historic Houses Trust of New South Wales. ^ "Obituaries: Stephen Jory, 'Lavender Hill Mob' counterfeiter". The Independent. London. 26 May 2006. Retrieved 14 October 2017. ^ Reid, Melanie (3 October 2007). "Hologram Tam's banknote scam could have spooked the banks". The Times. London. p. 13. ^ "Dine' Pride :: View topic - Bismarck Counterfeit Case". Dinepride.com. Retrieved 2012-10-18. ^ 8. Lee, Jennifer. (November 4, 2009) Brooklyn Woman Finds Counterfeit Penny Made of Gold New York Times.